By Thy resurrection from the dead, O Christ, death no longer hath dominion over those who die in holiness. So, we beseech Thee, give rest to Thy servants in Thy sanctuary and in Abraham's bosom. Grant it to those, who from Adam until now have adored Thee with purity, to our fathers and brothers, to our kinsmen and friends, to all men who have lived by faith and passed on their road to Thee, by a thousand ways, and in all conditions, and make them worthy of the heavenly kingdom. Immaculate Mother, I come to you to offer my love, my very life, and my Confession and Holy Communion in reparation for the sins committed against your all holy and Immaculate Heart. I desire too to offer the holy Rosary and meditation on its mysteries in reparation to your Immaculate Heart. - In reparation for those who insult you directly in your holy statues and images. O Mother of God and Mother of men, Mother mine, take me as your child, grant comfort to my poor sinful heart, even as I desire to grant comfort and offer reparation to your Sorrowful and Immaculate Heart. Amen. *Recommended for First Saturday devotions along with confession, communion, and five decades of the Rosary with at least fifteen minutes of meditation. The following is an excerpt from Cheerful Ascetic, the Blessed Francis X. Seelos' biography I am currently reading. I found it very interesting that Bl. Seelos gave missions in New York and New Jersey. 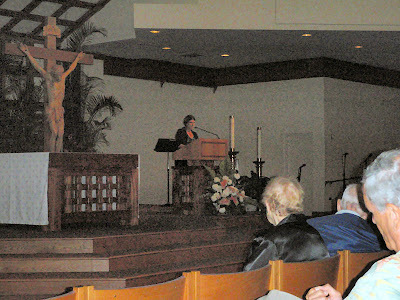 My family visited Old St. Peter's Church in 2009. I feel blessed being in a Church where a priest who will one day be canonized, actually gave a mission. 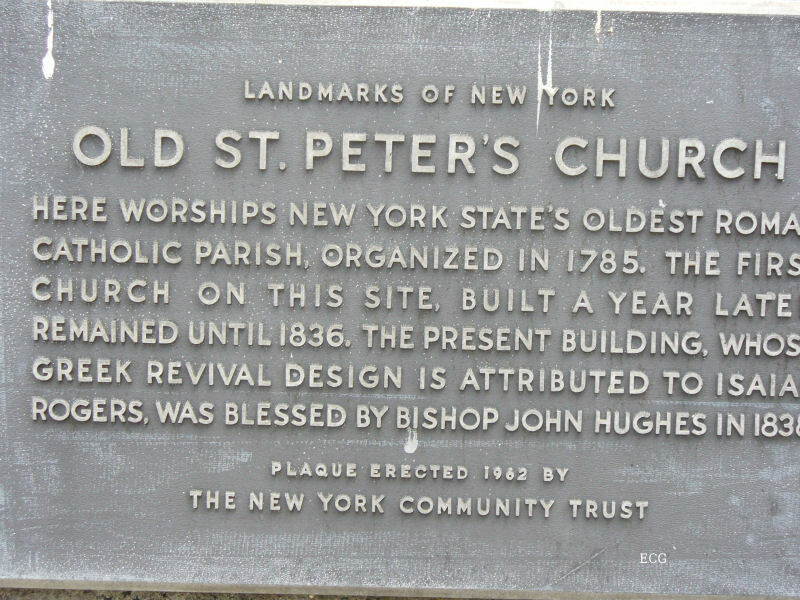 As you can see from the above plaque, it appears that Father Seelos gave the mission in the present Church and not the original one that stood at that site until 1836. 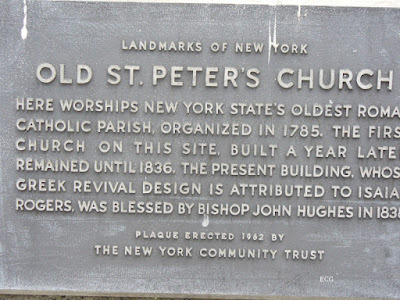 "Perhaps Seelos' greatest moment as superior of the band came in May, 1865, when he led six missionaries in giving a mission at Saint Peter's, the mother church of New York. It was a crucial mission, because since 1858, when the five convert Fathers had left them, the Redemptorists had not given the exercises in the metropolis." The following photos were taken at St. Ann's in Kaneohe. This was Monsignor's first talk. He gave a powerful speech about protecting the unborn and traditional marriage. 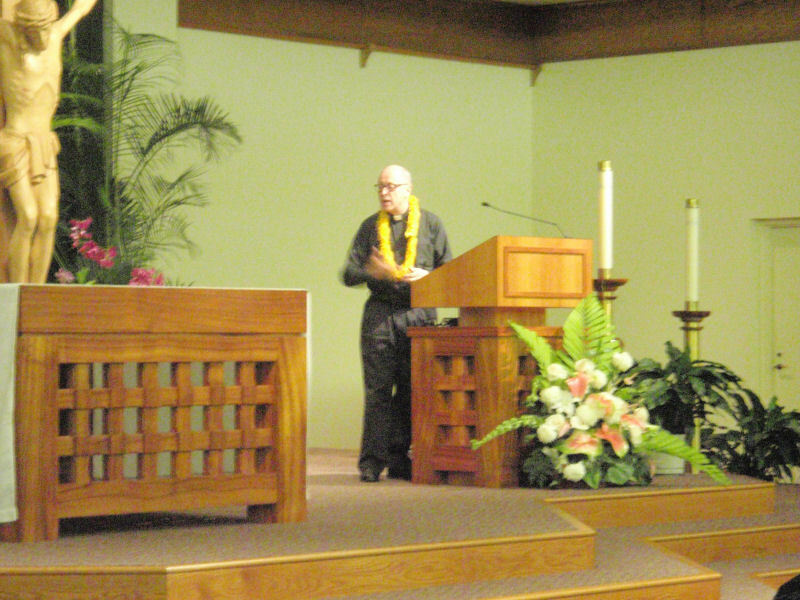 I wish that everyone in Hawaii had heard him speak. Sorry for the poor quality of the lighting. We had some trouble with the flash setting. 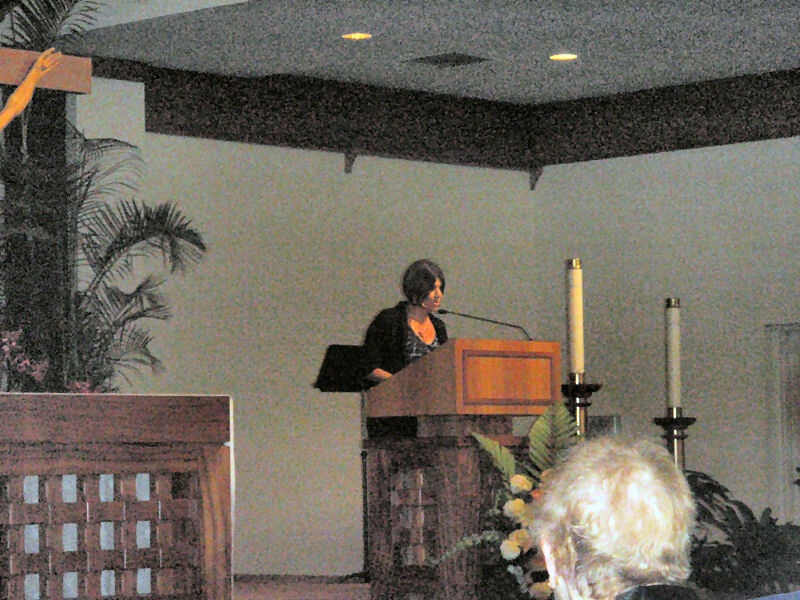 I want to thank my friend Lois for the loan of her camera to take the photos. My son had my camera that day as he was attending the HIFF functions. O Lady of heaven, sweet Mother of God, with Your Divine Son and the Angels of which you are Queen, descend into purgatory and release souls from the fires of mercy and Divine justice. 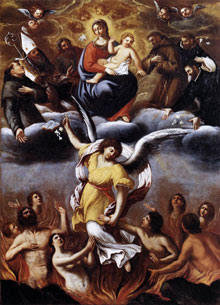 While the souls suffer in justice, it is by the mercy of God that, even though they are imperfect upon leaving this world, they are permitted a time of purgation after the death of their bodies so that they may become undefiled and enter into everlasting glory. It is a holy and wholesome thought to pray for the dead, as Your Divine Word has revealed, Almighty God (2Mc. 12:43:46). I offer the precious Blood of Jesus present at this moment in all the chalices of the world where the Sacrifice of the Mass is being offered in reparation for the temporal punishment still due to the suffering souls in purgatory. 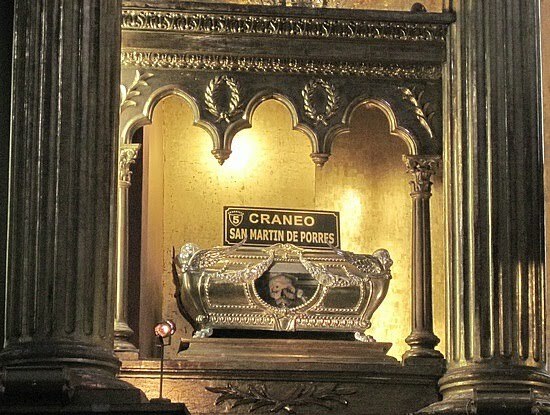 Accept the infinite Sacrifice of Your Son being perpetuated on our altars throughout the world. O Saints of heaven, pray for the souls in purgatory that they may soon enter into glory with you. Unite your prayers to mine as I offer my prayers, works, joys and sufferings of this day for I live yet in the time of merit, now deprived the souls in purgatory. O Queen of the Angels, grant to the souls who are not yet ready and worthy of heavenly glory, relief from some of their miseries, and speed the day of their deliverance. Eternal rest grant unto them, O Lord; and let perpetual light shine upon them. May the souls of all the faithful departed, through the mercy of God, rest in peace. Amen. My Jesus, by the sorrows Thou didst suffer in Thine agony in the Garden, in Thy scourging and crowing with thorns, in the way to Calvary, in Thy crucifixion and death, have mercy on the souls in purgatory, and especially on those that are most forsaken; do Thou deliver them from the dire torments they endure; call them and admit them to Thy most sweet embrace in paradise. Our Father, Hail Mary, Eternal Rest, etc. for partial indulgence. Lord, have mercy. Christ have mercy on us. Lord, have mercy. Holy Mary, Queen of the Most Holy Rosary, Pray for us. St. Martin, ever in the presence of God, Pray for us. 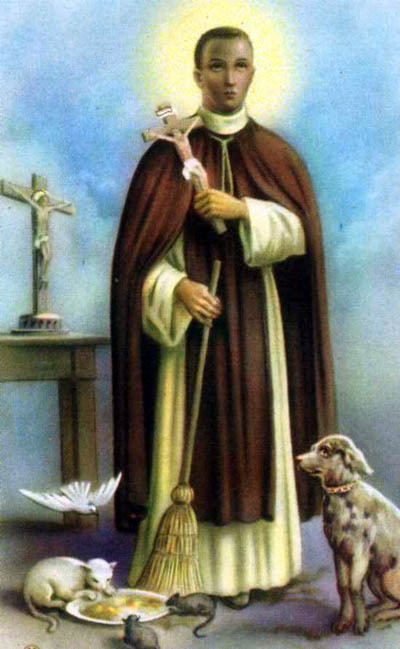 St. Martin, faithful servant of Christ, Pray for us. 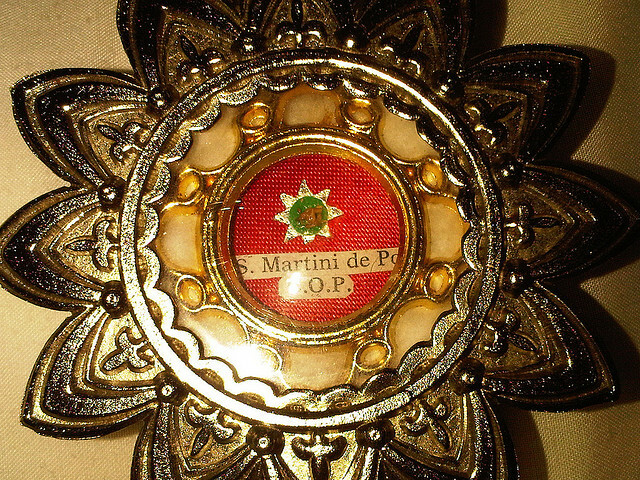 St. Martin, lover of the Holy Eucharist, Pray for us. 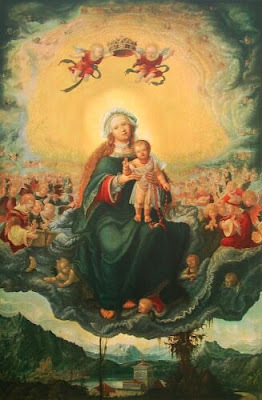 St. Martin, devoted to our Blessed Mother, Pray for us. St. Martin, spiritual patron of Americans, Pray for us. St. Martin, raised from the depths to a heavenly mansion, Pray for us. 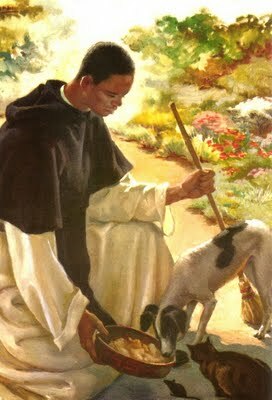 St. Martin, honored son of Saint Dominic, Pray for us. St. Martin, lover of the Most Holy Rosary, Pray for us. St. Martin, apostle of mercy, Pray for us. St. Martin, winged minister of charity, Pray for us. St. Martin, miraculously conveyed to far-distant lands, Pray for us. St. Martin, freed from the barriers of time and space, Pray for us. St. Martin, seeking the conversion of sinners, Pray for us. St. Martin, protector of the tempted and repentant, Pray for us. St. Martin, helper of souls in doubt and darkness, Pray for us. St. Martin, compassionate to the sorrowful and afflicted, Pray for us. St. Martin, consoler of the discouraged and unfortunate, Pray for us. 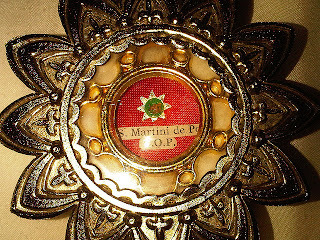 St. Martin, peacemaker in all discords, Pray for us. St. Martin, touched by all suffering, Pray for us. St. Martin, comforter of the sick and dying, Pray for us. St. Martin, angel to hospitals and prisons, Pray for us. St. Martin, worker of miraculous cures, Pray for us. St. Martin, guardian of the homeless child, Pray for us. St. Martin, humbly hiding God-given powers, Pray for us. St. Martin, devoted to holy poverty, Pray for us. St. Martin, model of obedience, Pray for us. 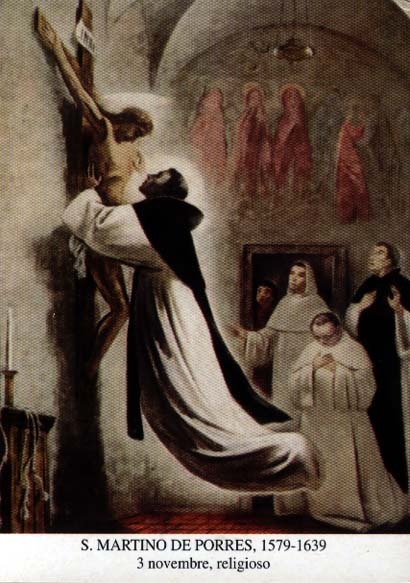 St. Martin, lover of heroic penance, Pray for us. St. Martin, strong in self-denial, Pray for us. St. Martin, performing menial tasks with holy ardor, Pray for us. St. Martin, gifted with prophecy, Pray for us. 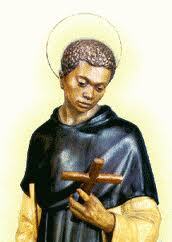 St. Martin, symbol of interracial brotherhood, Pray for us. Let Us Pray: O God, the exalter of the humble, Who didst make Saint Martin, Thy confessor, to enter the heavenly Kingdom, grant through his merits and intercession that we may so follow the example of his humility on earth as to deserve to be exalted with him in Heaven, through Christ Our Lord. Amen. 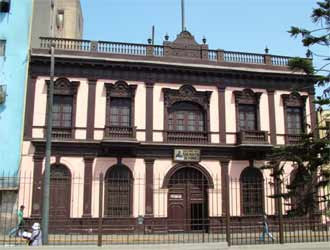 I thought I would share a video of typical Peruvian music. María Dolores Pradera - El rosario de mi madre. It is not the happiest of songs but the music brings back good memories for me. 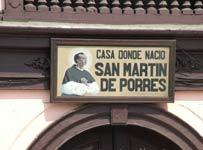 House Where San Martin de Porres was born. Non-Alcholic: Chicha Morada Made from purple corn. I found the above prayer card at Church. 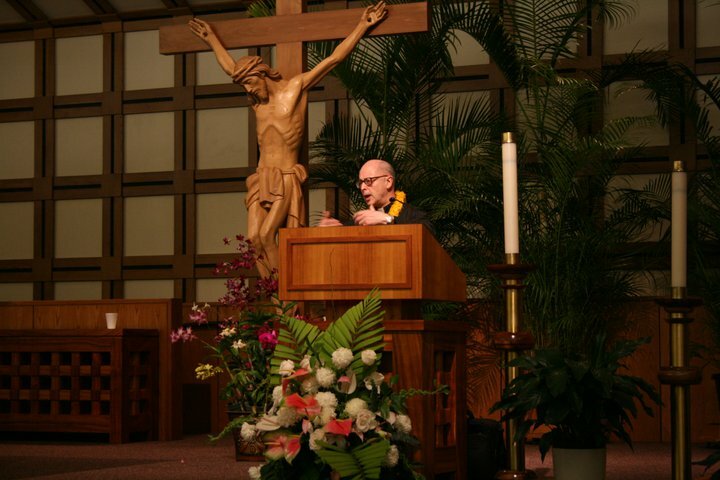 I have spent the last ten days spreading the Gospel of Life in Hawaii. Yes, sometimes our ministry demands that we take up even the most difficult of missions! 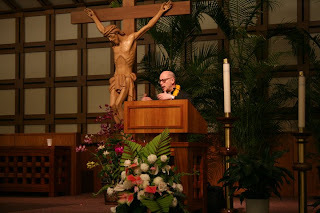 All joking aside, it has been a wonderful and fruitful tour, and I've had the pleasure of speaking to hundreds of Hawaiians in Churches and other venues. While it is difficult to imagine climate and ethnic traditions more distinct from Rome, it is always a blessing to find fellow faithful Catholics whose hospitality and faithfulness help one to feel at home. 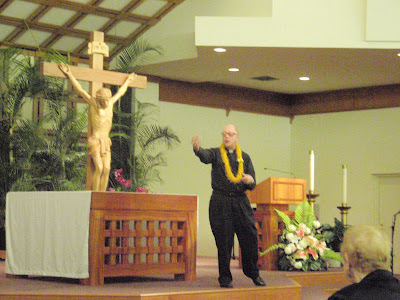 What a zeal for life I have experienced here among the Catholics and Protestants (indeed, it sometimes seems as if Protestants outshine Catholics in their outspokenness in defense of life)! The other day I was especially moved by the stirring testament of a Jewish convert who spoke eloquently of his commitment to defending life and family. 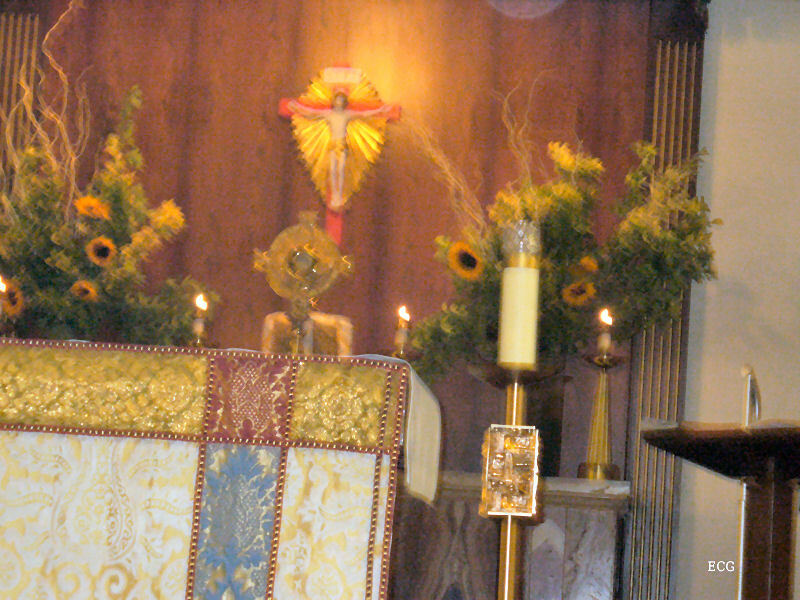 The high point of the trip, however, was being able to offer the Holy Sacrifice of the Mass in St. Philomena Church, a small chapel built by St. Damien of Molokai. 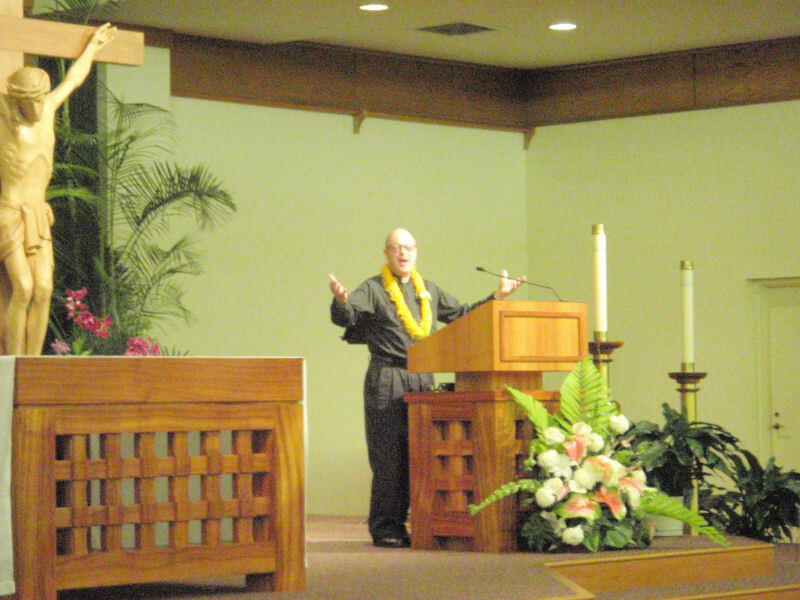 His was such a powerful witness to life and holiness and his influence still permeates the people and the island where he sacrificed so much to serve and evangelize those cast aside by society. St. Damien's holy courage is so needed today. As one of the newer saints of the Church, his example of sacrifice and bold proclamation of the truth is especially timely for us. Talk about a man who lived his faith in a coherent manner: he famously risked his own health, and ultimately gave his life, to care for many who suffered the ravages of leprosy and were shunned by society. But he never saw his service as being limited to mere physical comfort and healing: he knew that to comfort the body while doing nothing to save the souls of those given to him would be unjust. The Church sees the human person as being a unity of body and soul, not merely a physical being or just a soul with a body attached to it. To truly serve the human person, we must not only address his physical needs, but must address his spiritual needs as well, by living and preaching our faith. Again, what a consistent example of our faith we see in St. Damien. And this example applies to how we live our faith in so many ways. Next Tuesday, Americans have the opportunity to rally against truly unprecedented the assaults on life and freedom that we have seen since the most recent change in political leadership. 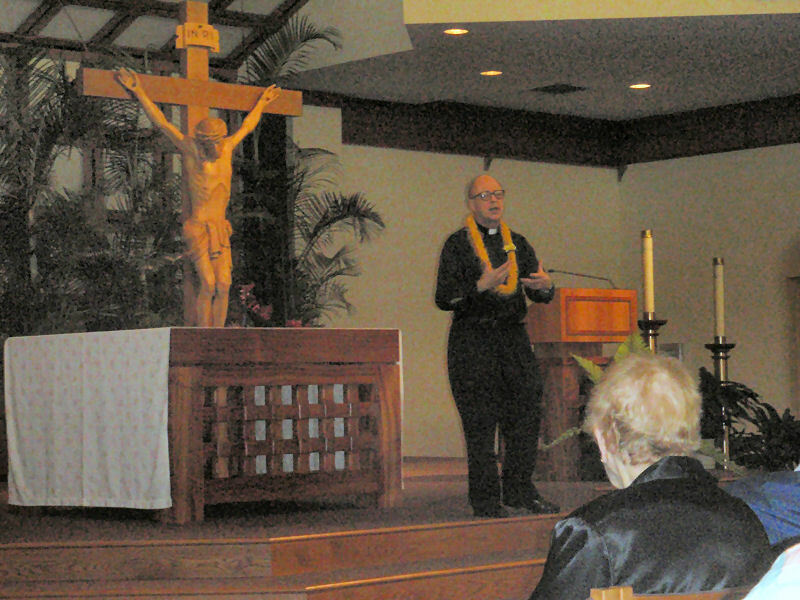 We have been discussing how our faith applies to the relevant issues (see here, here and here) and insisting that Catholics and all Christians strive to live their faith coherently, including in how they vote. To be sure, our vote is only one facet of how we must live our faith in public, but when our moment comes we owe it to ourselves and to the One who gave us this great gift of freedom to make the most of it. If we do not take this key opportunity to select representatives who will defend all human life and dignity, who will defend natural marriage and traditional family, and who will take a stand against ruinous and immoral economic policy, we abuse our freedom. Neglect is a form of abuse. Imagine if all Christians who truly believed in their faith would do everything they could to vote in a manner consistent with their faith, and help others who had difficulty in voting to do so as well. Now that would be change that we could believe in. St. Damien's example of lived, consistent, courageous faith shows what happens when one gives himself entirely to Christ. This kind of extreme courage is a gift to be sure, but in every moral choice we make, we are either preparing ourselves to shoulder more courage, or we are turning away. Our Lord wants to give us all the kind of courage he gave to Damien, and it is up to us to ask for it in prayer, and live in a way that shows that we can handle it and the other virtues we need to be more like Him. Your vote next Tuesday is one small way to step up to your responsibilities. See also if there is anyone in your community who may have difficulty voting, and see what you can do to help them get educated about the choices and cast their vote. Finally, pray that the will of God be done in this very important election: that truth, life, family and marriage be honored in the choices made by our fellow Christians and all people of good will. Saint Damien, pray for us. 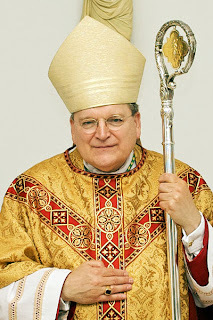 You can find both the text of Archbishop Burke's address and the video over at Human Life International. 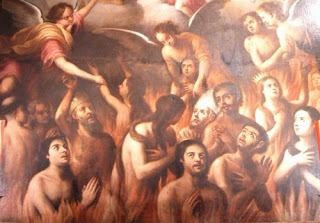 The Holy Souls are those who have died in the state of grace but who are not yet free from all punishment due to their unforgiven venial sins and all other sins already forgiven for which satisfaction is still to be made. 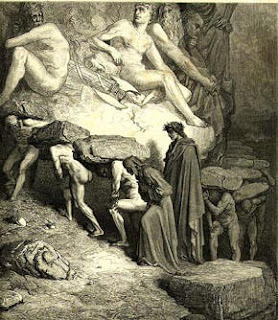 They are certain of entering Heaven, but first they must suffer in Purgatory. 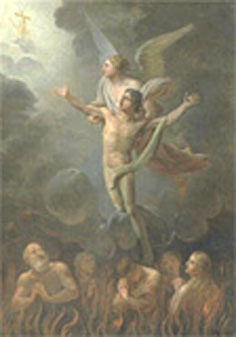 The Holy Souls cannot help themselves because for them the night has come, when o man can work (John 9:4). It is our great privilege of brotherhood that we can shorten their time of separation from god by our prayers, good works and especially, the Holy Sacrifice of the Mass. 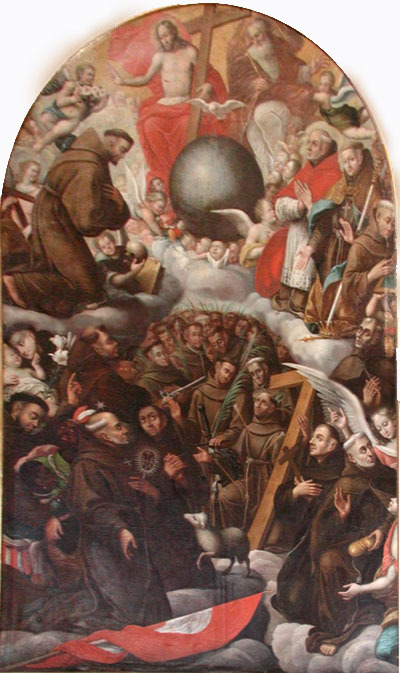 O Saints of God, you who live before the heavenly Throne of the Most Blessed Trinity, take our acts of petition, thanksgiving, adoration and reparation to Almighty God. Lay our poor humble lives before the Divine Majesty. Approach the Most Blessed Trinity through the Sacred Heart of Jesus, in union with Mary the Mother of God, St. Joseph and my Guardian Angel, and pray for us your weak and sinful brothers and sisters still upon earth. Remind Almighty God, that, just as His Divine Son once died for our sins and weaknesses upon earth, so now He may permit our sins and faults to be purified in the most precious blood of Jesus Christ. 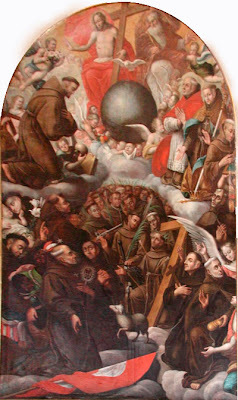 Ask the heavenly Father to gave upon the glorified and sacred wounds in the hands and feet of Jesus Christ and look into the glorified pierced side of our loving Savior, and send forth from those five most precious wounds abundant graces to save us from our sins and bring us to the glory of heaven. Amen. 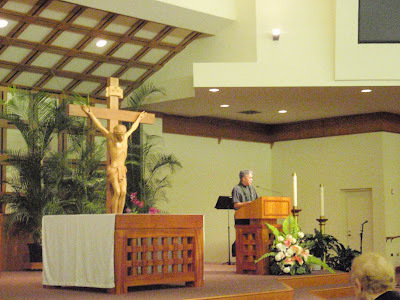 - Prayerbook for Catholics by Father Robert J. Fox Christendom Publications.